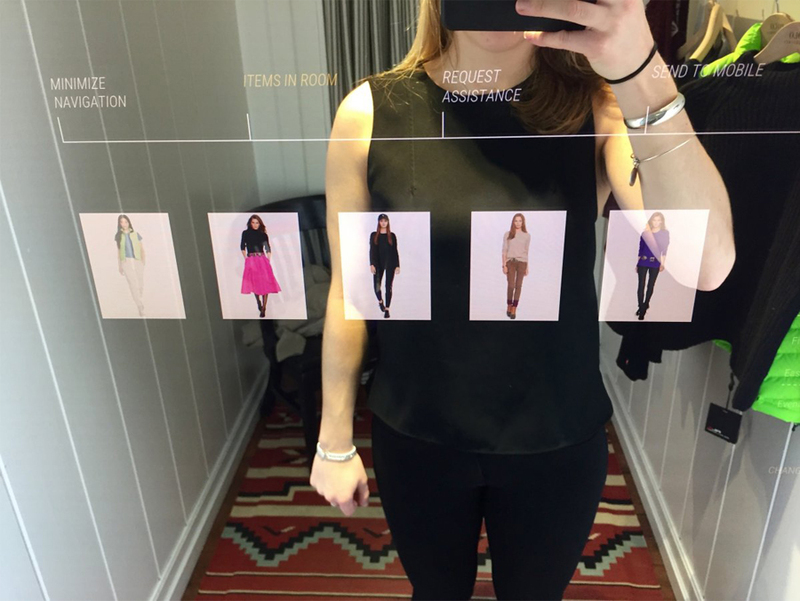 Could interactive mirrors be the future of shopping? Perhaps, as more and more of them are making their way into more retailers, giving shoppers a cross-over between physical stores and digital interactions. Ralph Lauren’s New York City flagship store scans items the shopper wants to try on, which are then displayed on the interactive mirror in their dressing room. The lighting in the fitting room can also be adjusted via the mirror to let shoppers see how the outfits look in different times of days. After trying out an outfit the mirror can be used to choose a different color or size option for a garment, which alerts a sales associate. Other items which go with your chosen pieces are displayed on the mirror to help users create a complete outfit and to encourage them to make more purchases. Items that a shopper likes but is not yet ready to buy can be saved and sent to their phone for a later purchase. Van Heusen created a retail environment complete with a “Virtual Trial” mirror which lets users see how outfits would look on them by simply scanning the items barcode and standing in front of the mirror as virtual garments are projected onto their reflection. The fitting rooms house interactive mirrors as well, letting shoppers try and compare different outfits by snapping pictures of them in each outfit for them to then compare them side by side to help them make a decision. Rebecca Minkoff’s flagship New York City connected store features a large, interactive mirror which shows off the latest Rebecca Minkoff brand content. The shopper can use the mirror to browse various looks and add them to their fitting room to try on. The interactive mirrors in each fitting room give the user the option to contact a stylist, change the lighting, and attach the items she has tried on during the visit to a personal profile so they can be accessed during future visits to the store and be able to receive intelligent recommendations based on the clothing saved. Items can be sent directly from the fitting room to checkout to finish the shopping experience. 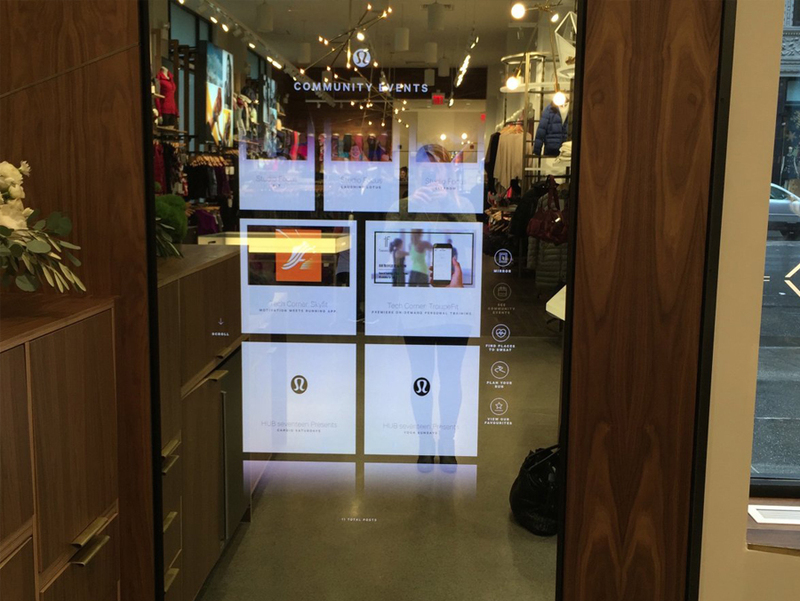 While other stores’ interactive mirrors concentrate on the individual, Lululemon’s interactive mirrors shift focus on helping shoppers learn about the community. The new technology was implemented in two of Lululemon’s flagship stores in Manhattan and Vancouver. The digital mirrors display points users in the direction of community events such as film screenings, places to exercise, as well as provides them with information about healthy living. This combination of fashion and technology could pave the way for the future of retail, creating the shopping experience more convenient for both sales associates and customers.